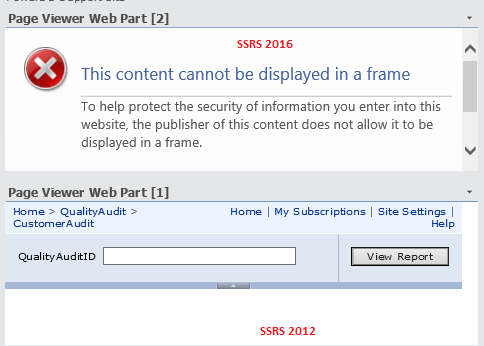 Normally we can embed SSRS 2012 or later reports from SharePoint WSS 3.0 to 2013 Site but now when we tried the new SSRS 2016 it displays below error even in SharePoint Online. Is there any way we can display it? Upgrading to SharePoint 2016 is not an option to us. Thanks! I added SSRS 2016 and 2012 report on same page in SharePoint 2013 and only 2012 shows. This is an Internet Explorer issue, not SharePoint or SSRS. Add your SSRS server to your IE Trusted Sites list IE Internet Options and it should display it. I am posting a screen shot below. It's not version issue . You can compare the results using Fiddler , compare the Fiddler trace when you using SSRS 2012 and 2016 then you will found the root cause . You can use ThorApps BI Service host your ssrs reports in SharePoint Online. Its available from the Sharepoint AppStore. Not the answer you're looking for? Browse other questions tagged sharepoint-online sharepoint-server sharepoint-foundation reporting-services or ask your own question. How to show SSRS 2016 report in iFrame at another SharePoint farm?